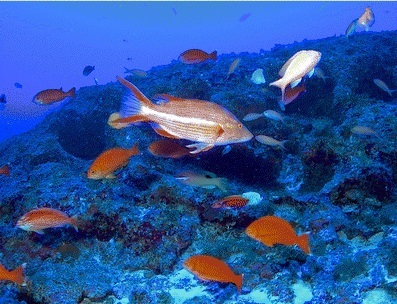 A study documenting deep coral reef fish communities composed exclusively of fish unique to Hawaii, which represents a globally significant reservoir of biodiversity, was recently published in the scientific journal Marine Biodiversity. Associated Press. Scientists have discovered a new locale in the Northwestern Hawaiian Islands with a truly astounding level of endemism. Kure Atoll is the northernmost coral atoll in the world, situated at the other end of the Hawaiian Islands about 1,300 miles northwest of Honolulu. Star-Advertiser. Sharks are eating onaga and other fish faster than fishermen can reel them in, compromising the quality and amount of fish that can be harvested in the Commonwealth of the Northern Mariana Islands, according to the territory’s acting governor, Victor Hocog. Civil Beat. Conservationists and others are crying foul over letters that state lawmakers recently sent President Obama that urged him to not consider expanding the Northwestern Hawaiian Islands Marine National Monument. Civil Beat. Experts have a good handle on the issues surrounding coastal hazards — like sea level rise and climate change – but what to do about these problems is another animal. In order to help address these coastal hazards, the University of Hawaii Sea Grant College Program has created a new center for excellence. Garden Island. The state Department of Education plans to submit draft transgender student guidelines to the Board of Education today. Tribune-Herald. The Aloha State has again received failing grades for manufacturing and logistics, according to a report from Ball State University. Pacific Business News. The cost of a private school education in Hawaii is on the rise again as the state’s largest independent schools are charging 3 percent more in tuition, on average, for the upcoming school year, according to a Honolulu Star-Advertiser analysis. The head of the Grassroot Institute of Hawaii is running for an at-large trustee seat on the Office of Hawaiian Affairs board. Civil Beat. Former U.S. Rep. Charles Djou and former Mayor Peter Carlisle are the seasoned politicians so far who will challenge incumbent Mayor Kirk Caldwell for the city’s top electoral post. Star-Advertiser. Former Honolulu Mayor Peter Carlisle has officially filed his candidacy for his old job, but City Council Chair Ernie Martin is staying out of the race. Civil Beat. City Council Chairman Ernie Martin announced Monday that he will not run for the office of Honolulu mayor. KITV4. A floundering plan to build retail, boating and wedding facilities on state land at the Ala Wai Small Boat Harbor received another blow in U.S. bankruptcy court Monday. Star-Advertiser. State and city officials are ramping up efforts to alleviate traffic woes along Oahu's Leeward coast. Hawaii News Now. The city is in the running for a grant to get a fleet of all new electric buses. KHON2. A helicopter will ferry a work crew to the top of the Haiku Stairs this morning to remove a makeshift swing from the ridgeline, where hikers have been swinging over the edge of a cliff that soars thousands of feet. Star-Advertiser. Of 11 pharmaceuticals commonly found in sewage, University of Hawaii graduate student Jeffrey Murl has recently determined that seven of them have the potential to leach into Oahu’s groundwater, one poses an uncertain risk, and the remaining three — which are perhaps the most likely to impact humans and animals at low doses — are unlikely to leach into Oahu aquifers. Civil Beat. A police officer shot and killed a man and his dog late Monday afternoon at a home near the corner of West Kawailani Street and Kanoelehua Avenue in Hilo. Tribune-Herald. A state Department of Land and Natural Resources enforcement officer accused of a New Year’s Day sexual assault on a 16-year-old girl at a Hilo beach was granted a postponement of his trial. Tribune-Herald. Kona dentist Cliff Kopp plans to pound the pavement in the name of homelessness one final time. Kopp’s fourth walk around Hawaii Island is slated to begin June 12 and is scheduled to end around June 20. West Hawaii Today. The owner of Hakalau Point says he is sticking to his last offer after the Hawaii County Council advanced a resolution last week seeking to preserve the site, formerly part of the Hakalau Sugar Plantation Co. Tribune-Herald. Travel Plaza Transportation is converting its entire fleet to zero emission commercial tour buses by 2020 in an effort to set a new clean air standard and fulfill a goal to be Hawaii’s leader in offering tour vehicles that promote sustainability. MauiTime. Maui County Council members gave final approval Friday to a bill to designate Sept. 15 as the deadline for claimants to file for a remnant parcel exemption for the tax year ending June 30, 2017, according to an announcement. Maui News. Paving work will cause alternating lane closures on Mokulele Highway this week, according to the state Department of Transportation. Maui News. Maui prosecutors have charged 37-year-old Alexandria Duval with second-degree murder in the death of her identical twin on May 29. According to witnesses, the sisters were arguing in a parked Ford Explorer when the driver accelerated the vehicle through a retaining wall and down a 200-foot cliff. Star-Advertiser. Plastic-free dining. Surfrider announces campaign to certify restaurants as Ocean Friendly. Garden Island. Councilwoman JoAnn Yukimura wants to make life better for the citizens of Kauai. Garden Island.